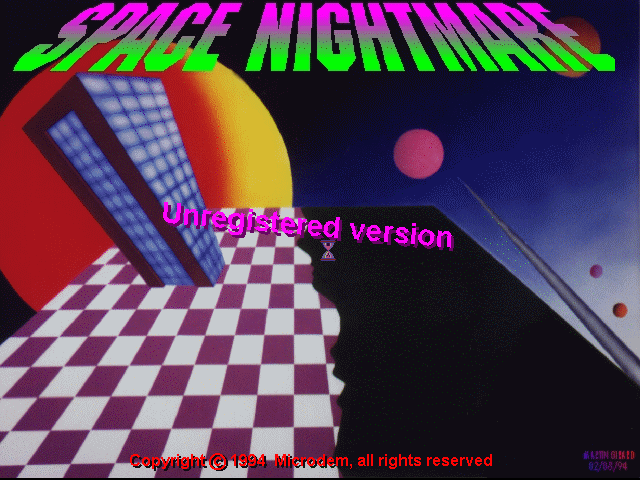 I’m not much good at shoot’em up games, which is why today’s game, Space Nightmare has a completely appropriate title. It was made by a Canadian company called Microdem in 1994. It is odd for a DOS game as it uses some high resolution graphics and what appears to be Mode X using 16 colours. Like most shooters it has a fairly throw away story about aliens coming to steal our copper, but what’s really important is you get to blow stuff up! Graphics support is unusual for a DOS game of the period. The menus are drawn at 640x480x256 if set to use SVGA and 640x350x16 for standard VGA cards. In game it appears to use 320x240x16 which is essentially Mode X, but it appears to be only using 16 of the 256 normally available colours in that mode. The game does perform quite well mostly, with some of the smoother scrolling I’ve seen in game. There is some slow down occasionally which seems to happen when the game is loading an image for displaying the first time. You notice this especially when it loads larger images like those for the end of level boss. This might not happen on actual hardware, I was playing using Dosbox. 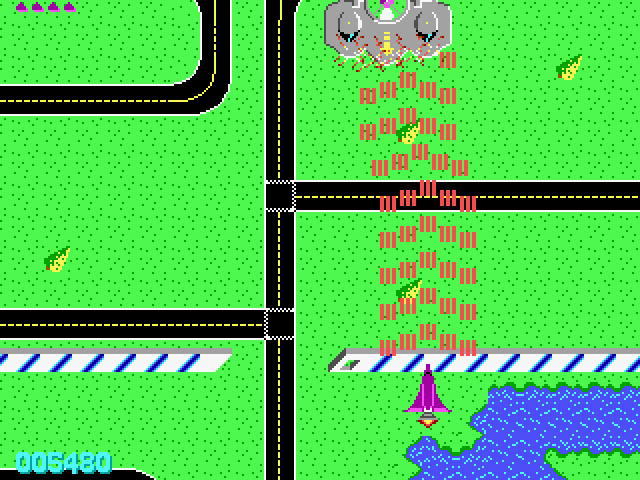 Artistically the graphics are quite nice and colourful, for EGA. There is dithering in some of the graphics because of the limited number of colours used. This could be a technical issue with the graphic engine, perhaps it only supports a 16 colour mode? Did they limit it for speed? I’m sure they could have gone with 256 colours and not compromised too much on speed and being in Mode X it should have been easy. So the decision to use 16 colours puzzles me. Sound comes from either the PC speaker or a Sound blaster card. I couldn’t test the PC speaker sound unfortunately because the game disables it as an option if it detects a sound blaster, which I guess is fair. The music is ok, although the tracks all sound fairly similar they do fit the theme of a shooter like this one. Sound effects are also ok, although weapon sounds get louder as you upgrade them. I suspect it plays the sound once for each shot in air, so once you’re upgraded it adds the sound from many shots together. It could have been implemented better, but you can turn down your volume as needed to compensate. When starting the game you get to choose between one of three ships. Dynamite only fires forward, but is one of the faster ships, upgrades simply add more projectiles. Blaster is slower, but upgrades add increasing amounts of spread shots which can effectively blanket the upper screen with bullets. Lastly Cancer fires forward only at first, but upgrades add shots going backwards and to the sides equally. I found Cancer the most successful as it allowed me to combat foes coming from more directions much easier. The enemies are mostly mobile air units of some type. They will often fire a burst of bullets directly at you, so dodging is absolutely necessary. I found this quite hard as the hit boxes for your ships are quite large. You can end up being trapped by several barrages and can’t avoid taking a hit. This wouldn’t be a problem if being hit didn’t take _all_ your power-ups, which leaves you very vulnerable. Whilst you can take more than one hit before dying, this is severely punishing. I found this game quite hard, I couldn’t get past the second level after many attempts. This could just be because I’ve never really been all that good at this type of shooter. I think that having more than one life, and not losing your power-ups when hit would have made this much more playable for me. People who are fans of vertical shooters (and are better than me at it) will probably find some fun, as long as you’re good at dodging.